A big part of raising vegetables from seed is upsizing the pots they live in until they make it out to the garden. For most vegetables the process is straight-forward: carefully pop the plants out of their outgrown container into a slightly larger one, add dirt and water. You don’t want to go too much bigger with the new container because the plants will spend all their time growing roots to fill all that dirt and not growing the actual plant. Most plants will only need to be repotted once before going outdoors. 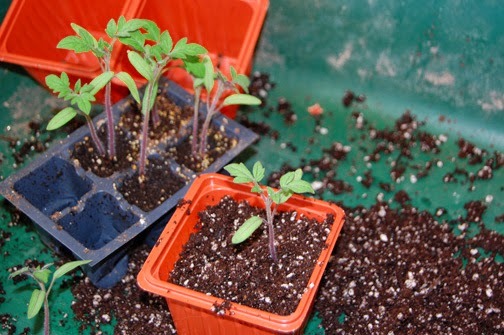 But tomato plants (and sometimes peppers) may take several transplants before they reach the garden. Especially if your growing season is short: You want the biggest plants possible going into the ground on your last frost date. Make sure the soil is wet so it doesn’t stick to the plastic container. Do not pull on the plant, because it will just break! Squeeze the sides of the cell or plastic container to loosen the soil and tip the plant out into your hand. Even if you have a six pack of cells, you should be able to get just one cell out at a time. I cup my fingers in the “receiving” hand so I can catch the soil on my fingertips while the plant is protected by the cupped part of my palm. If the plant is short, you’ll need to put some potting soil in the bottom of the new container to raise it up. Then fill with more soil around the sides. This plant will end up having soil almost up to it’s leaves. As with all plants, the bigger and stronger the root system, the healthier the plant. Tomato plants have the unique ability to grow roots out of their stems. You could actually break a branch off a mature tomato plant and root it in water or soil! The trick to getting a great root system going on a tomato transplant is to bury the plant up to it’s leaves in soil. Extra roots will grow along the stem. More roots mean more water and nutrition being consumed by the plant, so faster growth. I do this every time I move them to a larger container, and even when I plant them in the garden. They will have a nice tall stem again within a week. Another thing I learned is that because of this rooting ability, tomatoes don’t seem to mind having their roots disturbed when transplanting. With other plants you have to be extremely careful to not injure the roots and with some vegetables you need to plant the seeds directly into your garden soil because they won’t tolerate transplanting at all. Not tomatoes! The same plant a week later! You know how when you’re starting off seeds, it’s recommended that you put 2-3 seeds in each plant cell, since not all seeds will germinate? Then sometimes all the seeds germinate and you’re supposed to pinch off the smaller ones and keep the healthiest plant (if you pull out the smaller ones you will disturb the roots of your chosen surviving plant). Well, a couple of years ago I started separating the baby tomato plants that grew together in the cells, rather than pinching some back. All of the tomatoes transplanted this way survived and flourished! So now I end up with 2 – 3 times as many plants as I expected. I give away and donate whatever I can’t fit into the garden. Need some tomato plants? This entry was posted in growing tomatoes, repotting seedlings, repotting tomatoes, seed starting, upsizing tomato plants on April 13, 2014 by Farmer Deb.